In recent years, I have used my devotions to pray from the Bible, or I should say, to let the Bible guide my prayers; and, as our congregation knows, I have tried to make all my public praying utilize prayers and passages straight from the Bible. Not only do I believe this is a better way to pray according to God’s will, but I believe it will help others learn to pray as well. If you want to learn more about praying the scriptures, here is a link that has an article from Don Whitney’s book, Praying the Bible. Dr. Whitney is a professor of biblical spirituality and associate dean at the Southern Baptist Theological Seminary in Louisville, Kentucky. There is also on that page a way to sign up for five video lessons on how to pray the Psalms. I haven’t read the book yet, but the video lessons are short and insightful. I think you will find them helpful. Here is the article. Here is the book. Here is the video lesson sign up. Some of my most popular posts have been the simple graphics I’ve made, like Herod’s Family Tree. Since I am preaching on Ezra this week, I thought of another I’d made a few years ago. 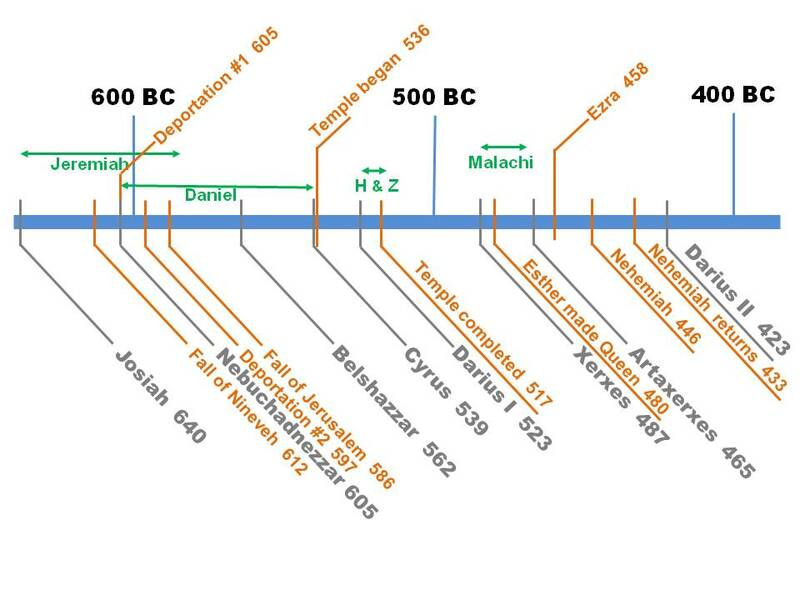 Here is a timeline of biblical events from 640BC until 423BC, which covers the Babylonian exile, and the periods of Ezra, Nehemiah and Esther. The gray print shows those who ruled over Palestine, whether Jewish, Babylonian or Persian; the orange print shows the biblical events; and the green shows the ministry of the biblical prophets. The “H & Z” in green represents Haggai and Zechariah. Hope this helps put things in perspective. It doesn’t seem to be showing up very big, so click on it to see the full-size version.